Indian Army SSC Tech 53rd Men 24th Women Oct Application Form 2019 – The Indian Army has released Indian Army SSC Tech 53rd Men 24th Women Oct Application Form 2019 at joinindianarmy.nic.in on January 23, 2019. The candidates can submit their form until February 21, 2019. The application form is inviting the application form unmarried male and female engineering graduates, and widows of defense personnel for grant of Short Service Commission (SSC). There is no Application Fee for joining this programme. Candidates will be shortlisted based on their performance in the semester/annual engineering examinations for SSB. Later SSB marks will be considered for final selection. Get here all the details of Indian Army SSC Tech 53rd Men 24th Women Oct Application Form 2019. Latest: The application form for Indian Army SSC Tech 53 Men and 24 women is on the go. Scroll down to access the link. There will be no written examination for SSC Tech 53rd Men and 24th Women Entry and candidates will be shortlisted based on their percentage of overall marks obtained during graduation (engineering degree), based on a cut-off, set by the Indian Army. The officially declared dates of the Indian Army SSC Tech 53rd Men 24th Women Entry are listed in the table below. Candidates should check this section very carefully before filling the SSC Tech 53rd Men 24th Women Oct Application Form 2019. Application Form of a candidate who does not fulfill the eligibility criteria will not be accepted. The eligibility criteria for the entry, as prescribed by the Indian Army is detailed out here. Currently in the final year of an Undergraduate Engineering course. 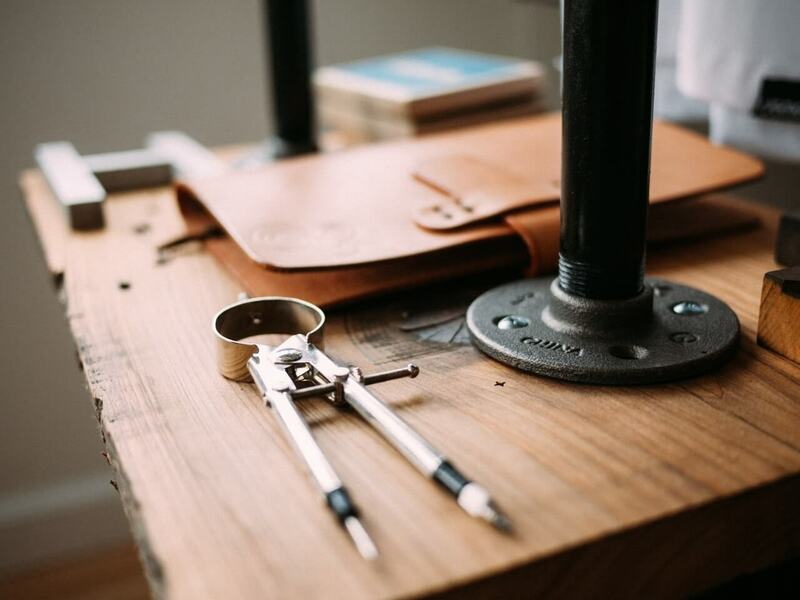 Note: The candidates studying in the final year examination of Degree Course must produce the Engineering Degree within 12 weeks from the date of commencement of training at OTA. The candidate should be between the age of 20 to 27 years (as on 01 October 2019). For a candidate who is eligible for the Widow of Defence Personnel, there will be age relaxation and can be 35 years old (Max) as on 01 October 2019. 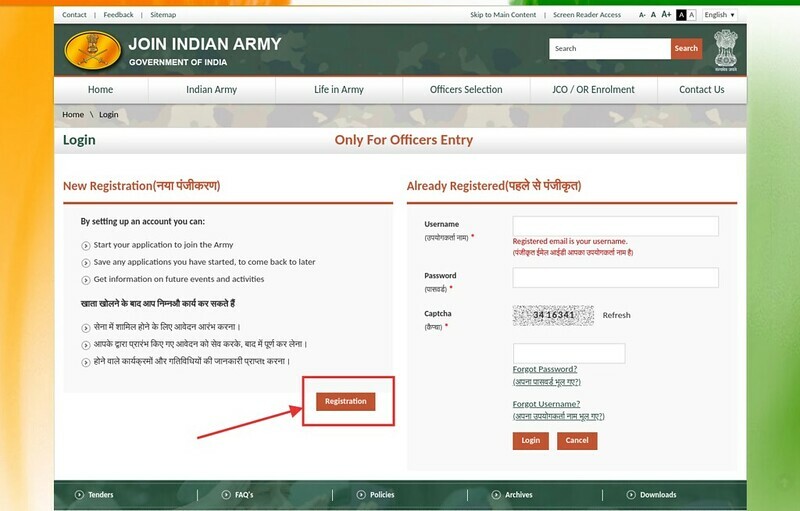 The application fee of Indian Army SSC Tech 53rd Men 24th Women Oct 2019 is Nil, the candidates can fill their form free of cost. All candidates (for SSC Tech 53rd Men and 24th Women) except for the SSC(W) (Widow of Defence Personnel) candidates, have to fill the Online Application Form through the official website, i.e. www.joinindianarmy.nic.in. The SSC(W) candidates will have to submit the Offline Application Form. All candidates will require the following documents to fill their Application Form. Certificate issued by University authority for conversion of Grades into marks followed by the University. A certificate issued by University authority regarding the cumulative percentage of marks up to 6th Semester for Engineering majors / 2nd Semester for M.Sc Computer Science graduates / 8th Semester for Architecture majors. 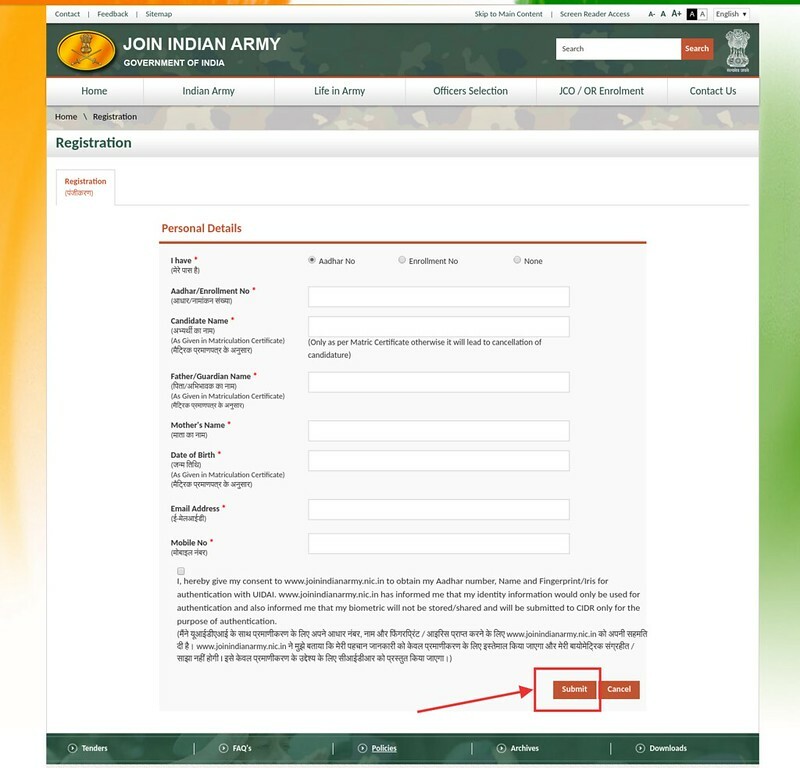 Candidates aspiring to join the Technical branch of the Indian Army Short Service Commission can now fill the online application form available on the official website of Indian Army, i.e. joinindianarmy.nic.in following the next mentioned steps. Click on the above link, which lands to the registration page directly. The Registration window will open as shown in the next image. The new candidates can click the “Registration” link. The already Registered candidates can directly Login to access the Application Form. The New Registration Form will be displayed as shown in the next image. Fill in all your details including name, Aadhar Card number, Father’s name, Mother’s name, Date of Birth, Email ID, and Mobile Number accurately. Also, there is a declaration of consent that needs to be checked before submission of the Registration Form. When you click the “Submit” link you will be taken to another page, page 2 of the Registration form where you will have to fill in your educational details. After submitting this page, you will be registered as a candidate and upon the basis of your educational and general eligibility, the website will list all the recruitments you are qualified for and you will have to choose to fill the application form for your desired entry. Here most of the details are already entered from the Registration details. You will have to upload your photograph and scanned signature here in the specified format, i.e. photograph size between 5 KB to 200KB, and signature image between 5 KB to 10KB. Click the “Save & Continue” button each time you finish filling a page, and you will be able to proceed to the final submission of your application. After the entire procedure click on “Submit now”, after carefully ascertaining that the correct details have been filled in. 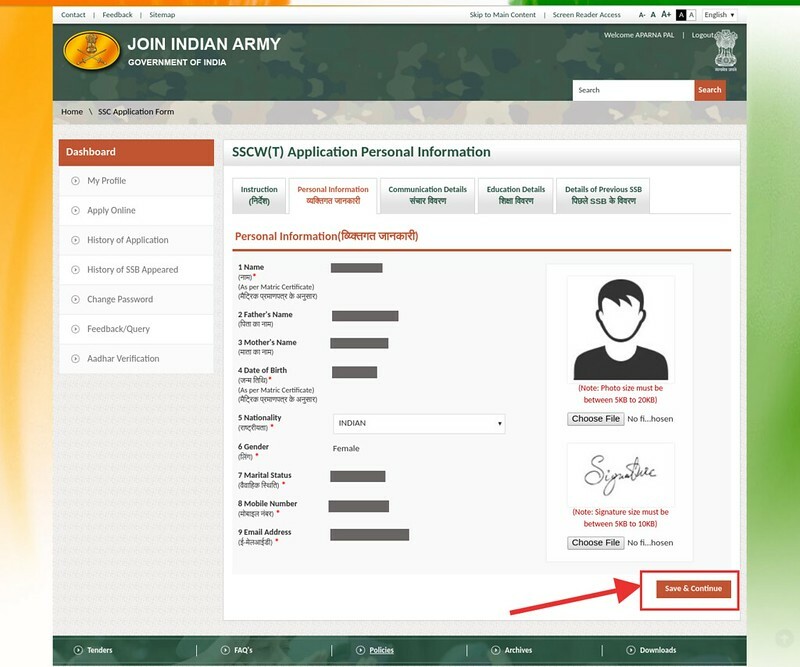 After submitting, click on the “PDF” link and take 2-3 photocopies of the application form containing the Roll No and other details generated by the system, as now you are a registered candidate for the Indian Army SSC Tech 53rd Men or 24th Women Entry Scheme. A candidate who will clear the minimum cut-off set by the Indian Army recruiting authorities will get the Call Letter for the further process i.e SSB Interview. Candidates will put through a two-stage selection procedure. Those who will clear Stage I will be able to proceed to the Stage II. Those who will fail in Stage I will be returned on the same day and ones clearing Stage I will appear for Stage II. Those who clear the Stage II will have their Medical examination at the Military Hospitals. A merit list will be prepared engineering streamwise on the basis of the marks obtained by the candidate in the SSB Interview. Those high in the merit list and who come within the stipulated vacancies, and are medically fit will be issued the joining letter for a pre-commission training period at the Officers Training Academy, Chennai, Tamil Nadu. The training period will commence from the month of October 2019. The Indian Army conducts this recruitment twice a year to fill in the vacancies opening up in the ranks of the Indian Army Short Service Commission (SSC) Tech 53rd Men and 24th Women forces. The Indian Army is inviting all unmarried male and female engineering graduates from across the country to take part in the recruitment, as this is a technical entry that requires officers well educated in technical matters. Engineering graduates from Civil, Mechanical. Electrical, Aeronautical, Computer Science, Electronics and Telecommunication, Electronics and Optic/Fibre Optics, Production, Architecture can stream are eligible to apply for this recruitment. Being able to join the Indian Army is considered as one of the greatest privileges in the nation.